Over the next several weeks Dave Rodgerson, Retail Industry Lead for Microsoft Canada will be hosting a series of webinars where retailers can listen to conversations about how Digital Transformation is affecting the industry. 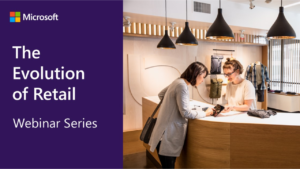 Introducing the Evolution of Retail Series – how the solutions Microsoft and our Partners have developed will help to transform your business today. In this series you will hear about all the relevant topics that are impacting the retail industry today including, Omni Channel, Blockchain, Digital Disruption, Modern POS and how they are disrupting the Retail industry. Dave will be joined by Microsoft Partners who will share their perspectives and insights, along with previews of the innovative solutions they have developed for our retail customers.